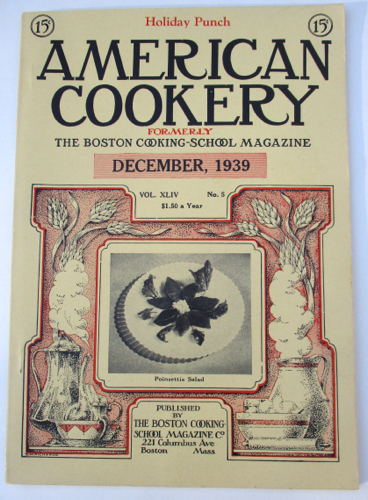 I was sorting some of my old magazines the other day when I came across a vintage one I'd forgotten about buying at an antique mall a few years back, the December 1939 issue of American Cooking, the Boston Cooking-School Magazine. 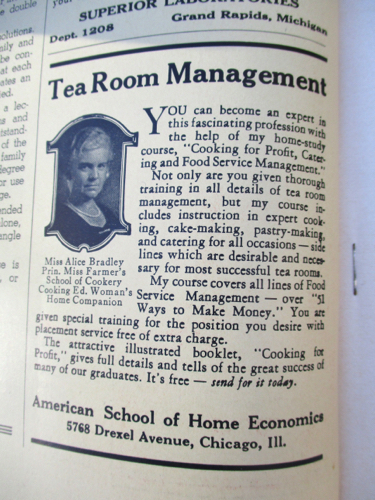 Several tea-related items inside caught my eye, including this ad targeting those interested in Tea Room Management. I suppose magazines have had question-and-answer columns forever, and I found it interesting that this magazine numbered its questions ("Query No. 6124"). 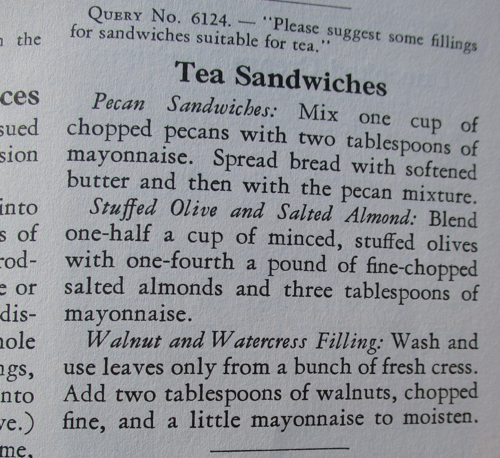 The tea sandwiches sound … intriguing. I think this column must have been sponsored by a mayonnaise company. And finally, the back cover featured a product I happily use myself. 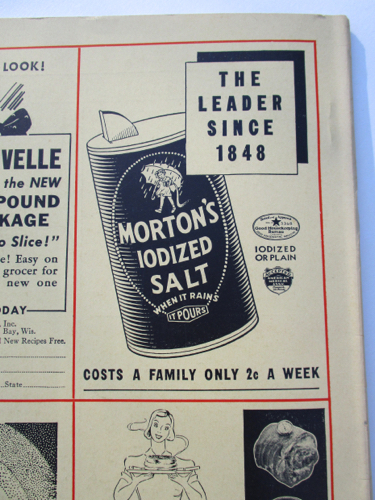 I found it interesting that the salt "costs a family only 2¢ a week," and I'm happy that Morton's Iodized Salt remains a good buy today! So Thanksgiving 2017 is in the books! This is at my sister's house on Thursday since it was her year to host. My brother-in-law was setting up the big family shot on a camera on a tripod, and apparently he didn't make it back in time! 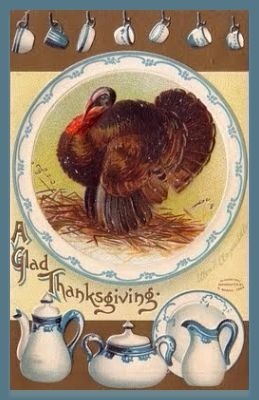 At any rate, we had a great time of feasting and enjoying each other's company, as well as visiting with some of my brother-in-law's family who joined us this year. 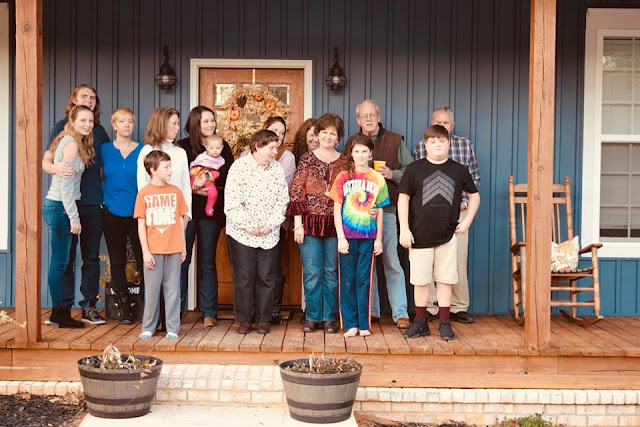 Our meal consisted of turkey, dressing and gravy, yeast rolls, seven-layer salad, olives, macaroni and cheese, cranberry sauce, broccoli casserole, green bean casserole, pinto beans, mashed potatoes, and deviled eggs. For dessert we had a strawberry cake and pecan pie (both made by my dad), lemon pie, and chocolate chip pie. And of course lots of tea to accompany all of the above! Is there anything different on your menu? 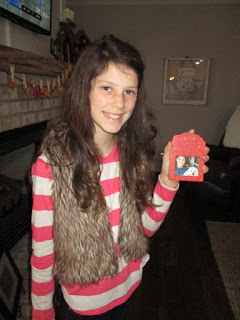 One of the Thanksgiving traditions I most enjoy is giving all the children in our family a Christmas ornament at Thanksgiving. Madison, at left, is about to leave the nest and get her first apartment with a girlfriend, so her ornament was a cross that says "God's love is always with you." 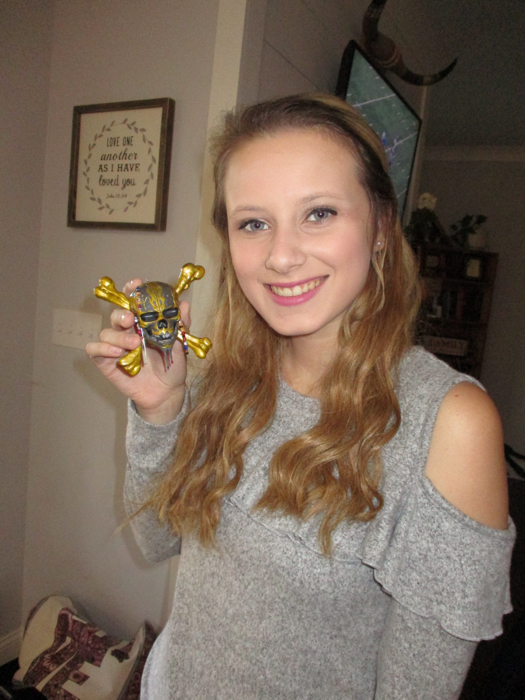 Cari's ornament, by request, was Hallmark's latest with a "Pirates of the Caribbean" theme. Amelia's says "Faithful Friend Forever" and has a photo of her with her latest canine addition to the family, a Great Pyrenees named Luke. Matthew is still a fan of Spiderman, so that was the character for his ornament this year. 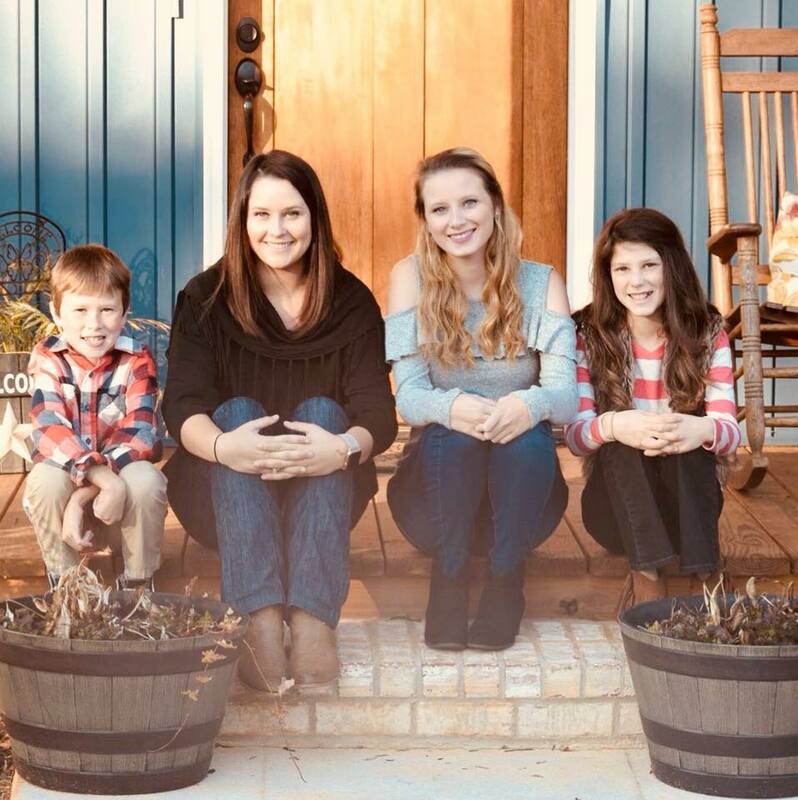 And then on Friday, we had a visit from my stepson's family, so we got to see our Georgia grandkids, Bella and Owen, as well! 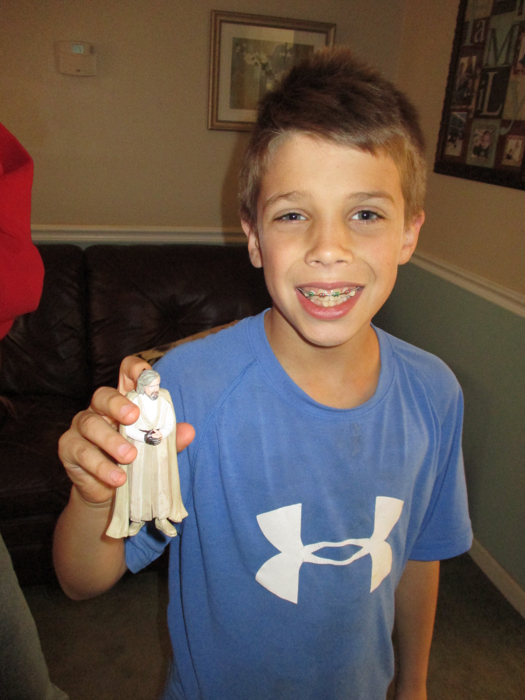 Bella's ornament this year was a Madame Alexander doll, and Owen's was Luke Skywalker. 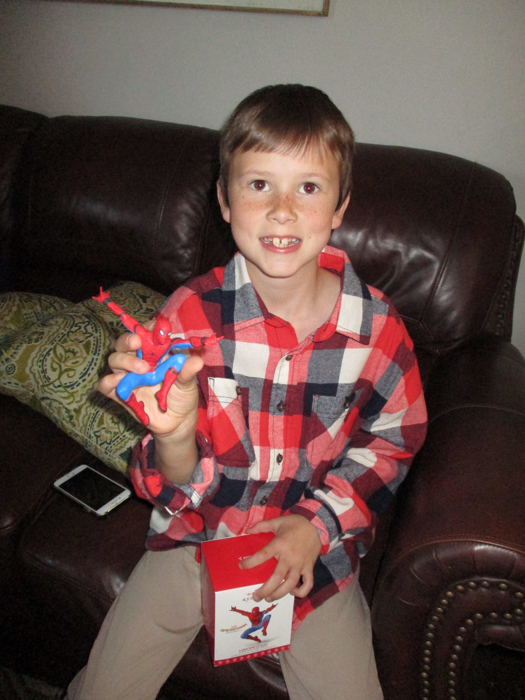 It was a great kickoff to the holidays for my family, and I sure hope it was for yours as well! Christy of Lilbitbrit! 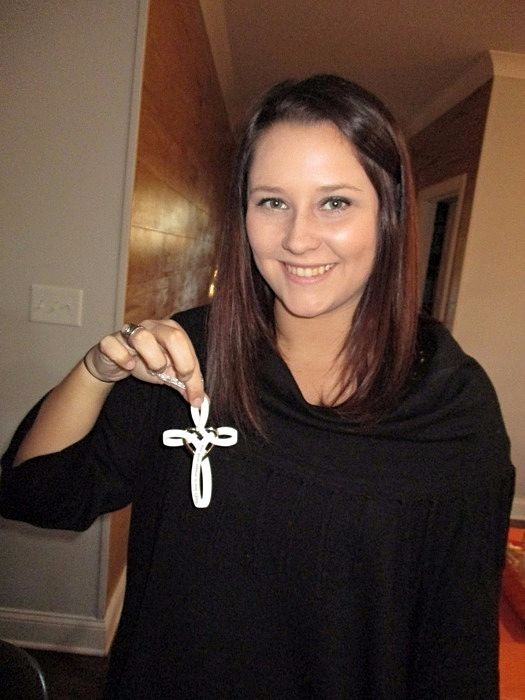 Congrats to Christy, and thanks to all of you who entered. Now to find a fun Christmas giveaway! When I was out Christmas shopping in Rome the other day (Georgia, not Italy), I came across a brand and variety of "tea" I'd never seen before, Cacao Tea. 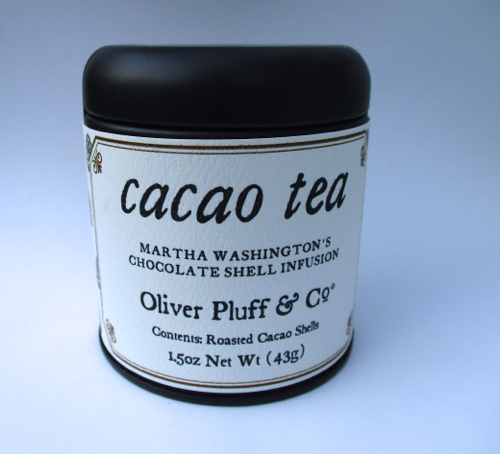 "Martha Washington's Chocolate Shell Infusion" from Oliver Pluff & Co., it said. Intriguing! And it consisted entirely of "roasted cacao shells"? Hmm. 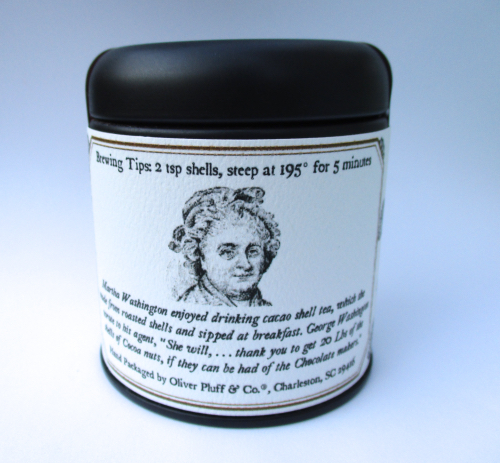 The back of the tin mentioned that Martha Washington sipped this at breakfast, and I'd never heard that before, so if anything else, I figured the tin was worth the $9.95 for the new bit of tea-ish history. I asked the shopkeeper if there was a sample I could at least sniff (tasting would have been even better), and she led me to a display on another counter. It smelled like rich hot chocolate, so I decided to take a chance and purchased the tin. The roasted shells looked like broken pecan shells. And the taste? 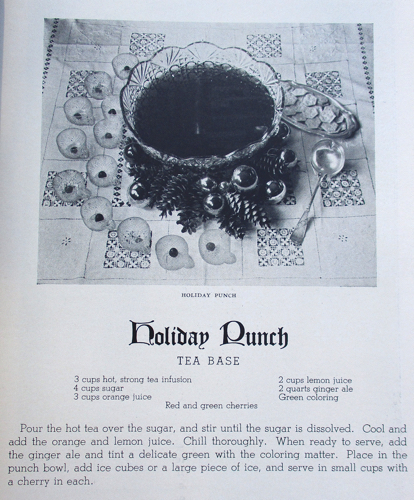 Well, not for nuthin' is this blog's motto "We try all the bad teas so you don't have to!" (Not really, but it ought to be.) 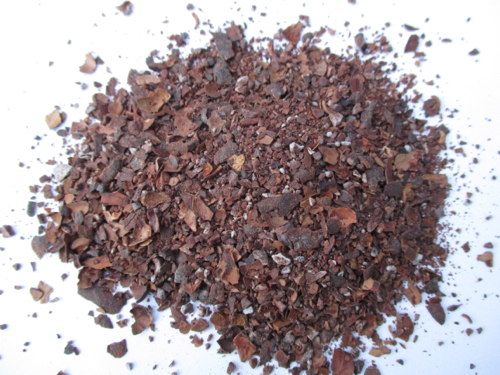 Imagine burning your hot chocolate so that it tasted bitter, then throwing out half of it and replacing it with hot water so that you ended up with watery and bitter hot chocolate. That's what this tasted like. Alas. So if you're out shopping today, remember, all that glitters is not gold, and all that smells like chocolate does not necessarily taste like it! 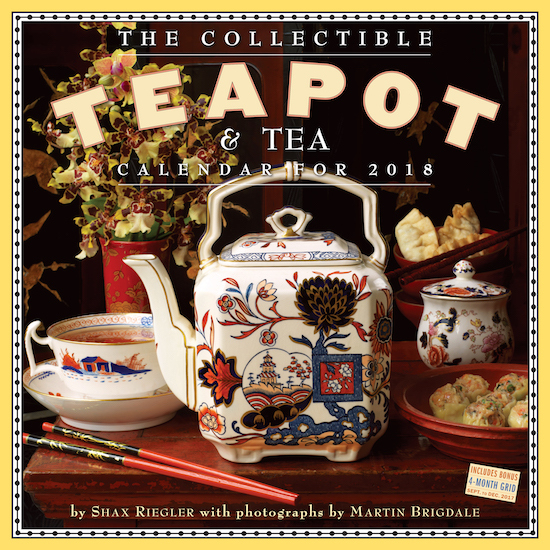 For the November giveaway, I thought I'd choose something that is a favorite item for many of the tea lovers I know, the Collectible Teapot & Tea Calendar! So if you don't have the 2018 edition yet, don't order it until you enter this giveaway and see whether you've won. If you'd like to be entered in the giveaway, just leave an "Enter me" to this post between now and 7 a.m. Friday, November 24, making sure I have a way to contact you if you're the winner, and you'll be entered to win. (US entries only, please.) Good luck! Emma heated the kettle on the gas-powered stove. As they waited for the water to boil, she told Sophia about her family, hoping to put her at ease. 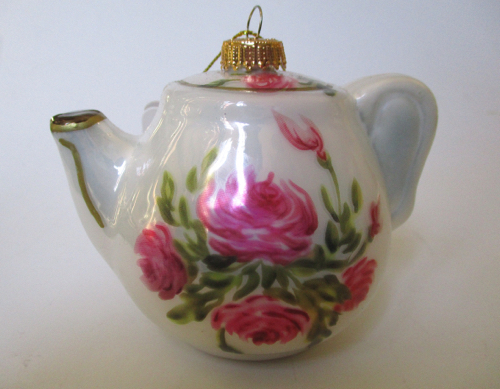 She'd made it through all of the grandchildren when the kettle let out a whistle. She jumped up to pour the hot water over bags of herbal tea. "Gut for the nerves," she murmured, setting a mug in front of Sophia. Did you ever think about what the Amish eat and drink? I didn't until I happened to read this new Amish cozy mystery that I so enjoyed, I thought some of you might want to check it out as well! To be honest, I've never read an Amish mystery. I know there's a slew of them out there, but the topic never appealed to me. But when I came across this title on NetGalley and saw the intriguing cover with its old-fashioned diner stools, I downloaded it. 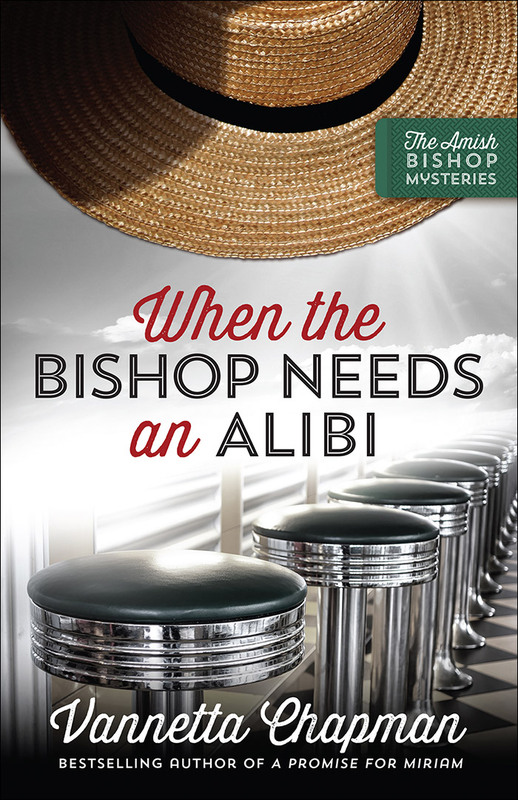 Henry Lapp, a widowed Amish bishop in Colorado, keeps finding himself in the middle of murder investigations. This is the second book in the series and frequently references a "Monte Vista arsonist" he helped find previously. 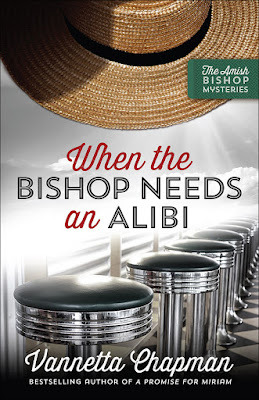 This go-round, the bishop is drawn to help a young waitress in the local diner he frequents. Sophia seems nervous and on edge, and Henry feels drawn to help her, even getting his lady friend, Emma, involved. They sense something very dangerous is going on in Sophia's life, but she won't reveal what it is. Still, Henry and Emma feel compelled to help, especially when a body is found. It's quite fascinating to consider how Amish people might help solve a murder. They are definitely not much help when it comes to technology (a subplot involving a flash drive is quite fun), yet their common sense and people-watching skills more than make up for what they lack in modern-day know-how. Henry and Emma's faith, naturally, is a big part of this story, and the author does a fine job of weaving in the spiritual elements without seeming preachy. Her characters come across as authentic—and authentic in their struggles—and watching these Amish folks solve a mystery was more delightful than I could have imagined. I'm hooked and look forward to reading other books in this series! "Suited to a T — A Christmas Story for the Little Ones at Home"
Want a nice little pre-Christmas treat? 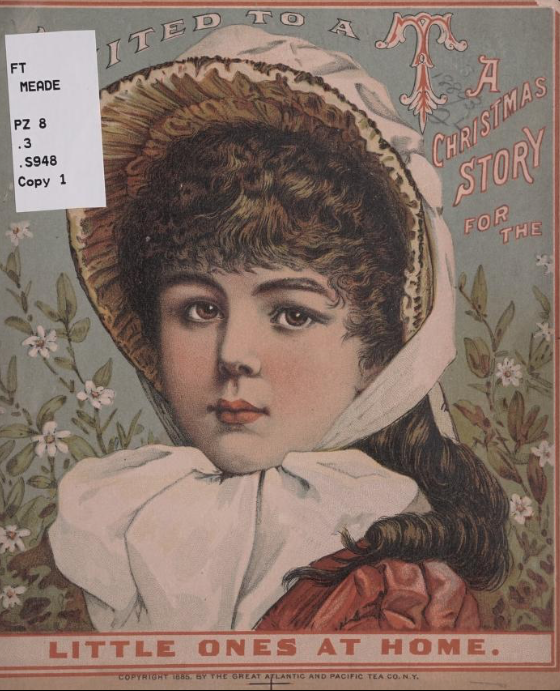 I found "Suited to a T — A Christmas Story for the Little Ones at Home" on the Library of Congress website, and it's a darling tale in which tea features quite prominently. In this scene, we're told that "Dear grandmamma" was a woman who "often sipped her tea and smiled when listening to the happy child." 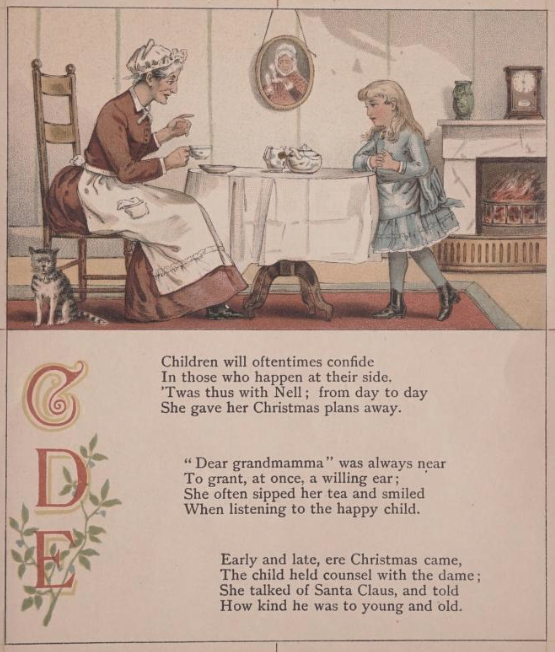 And I won't spoil the story by telling you what "Dear grandmamma" got from Santa Claus, but since this booklet was published by the Great Atlantic and Pacific Tea Company, I'll bet you can guess! Click here if you'd like to read this tale for yourself. 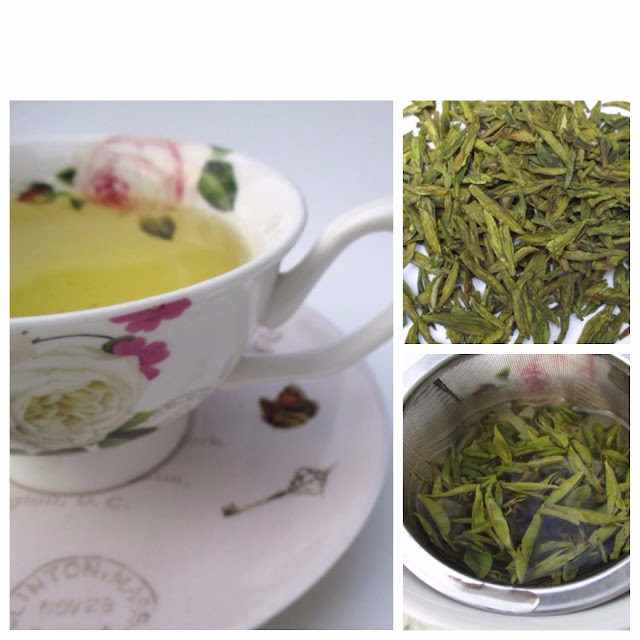 Tea companies are wise to send out emails about their new offerings. 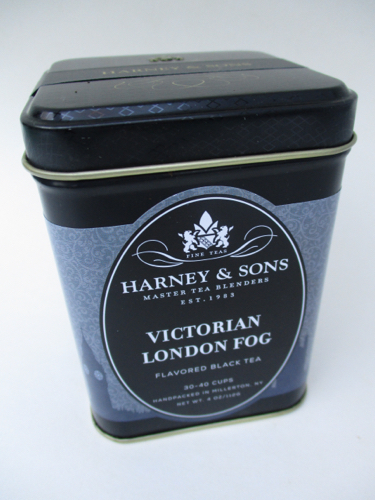 I got one from Harney & Sons last week about their new Victorian London Fog tea. 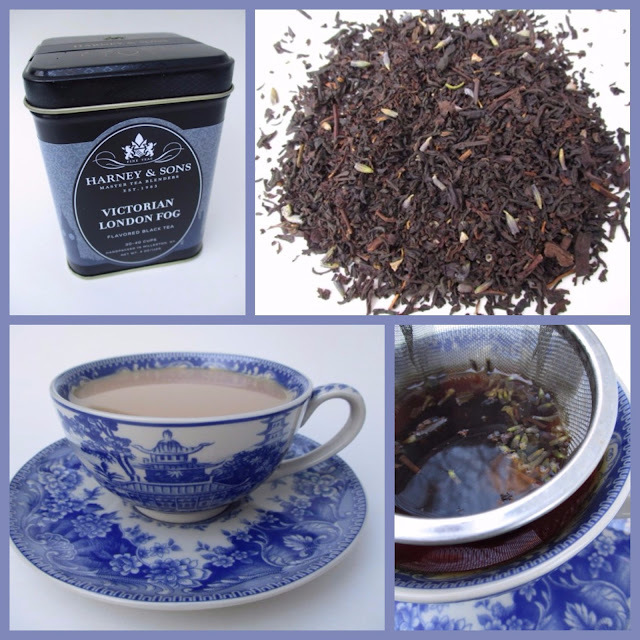 Now, they had me at "Victorian London Fog," but when I also got an offer to receive $5 off plus free shipping, I started clicking like mad, knowing full well I was going to place an order. 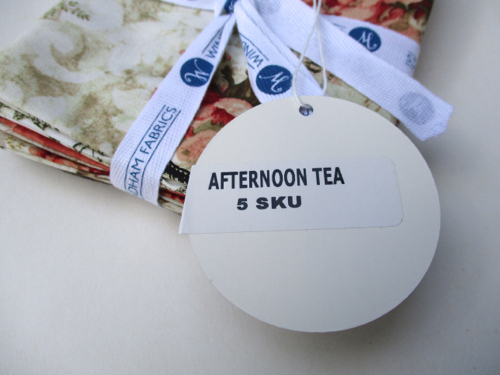 First, a few words about this thoroughly delightful new tea. I've had "London Fog" drinks in several tea establishments over the past few years. Harney says this tea was the winning blend in their Tea Blend Sweepstakes (how did I not know about that? 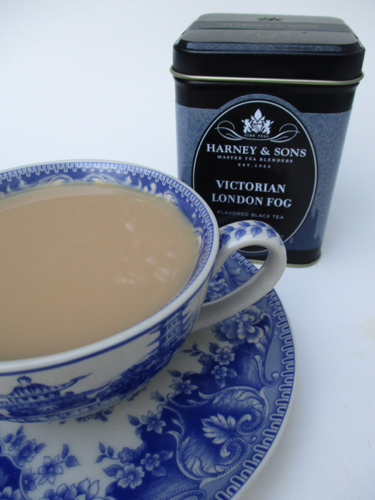 ), and that "the beverage called London Fog originated during the Victorian era. 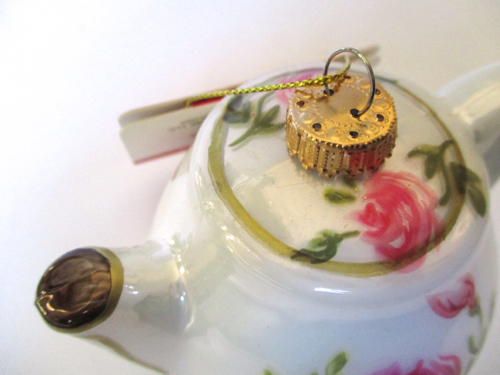 It is traditionally an Earl Grey served with steamed milk." So I added milk to mine and loved it! 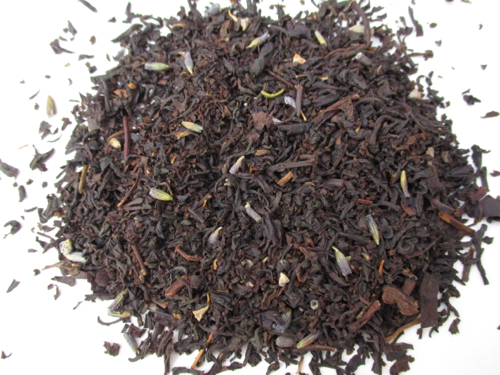 As you can see from the loose tea, this tea has lavender buds blended in, along with bergamot and "hints of vanilla." 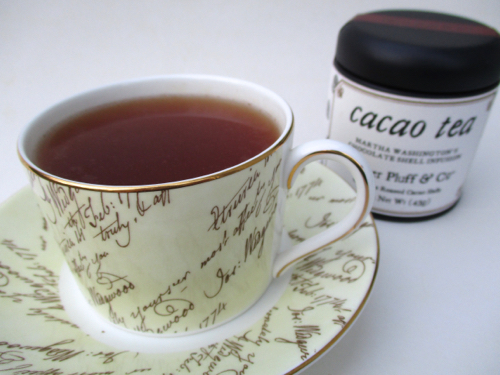 If you like Earl Grey with a twist, this is definitely a great tea to try. 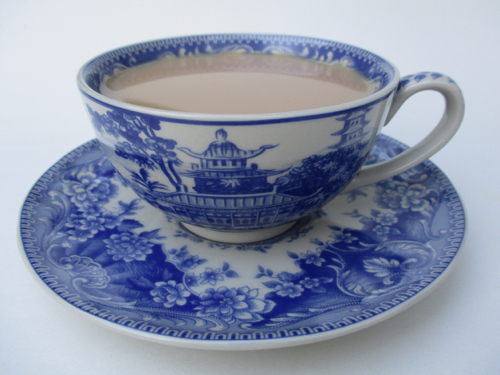 Harney is also offering a new line of Madison Bay transferware teacups and saucers. I ordered the blue and white set (it's really more of a blue and creamy ivory color), and I think the patterns are lovely. You can see all five colors by clicking here. Have any of you tried this new tea? I'm a fan, and if you haven't tried it yet, I bet you will be too! Thought y’all might appreciate this. I am on the tail end of a horrible cold, the kind that first sent me to Walmart for a new space heater for my office, an electric blanket, off-brand Thera-Flu-like product (green tea and honey lemon flavor! 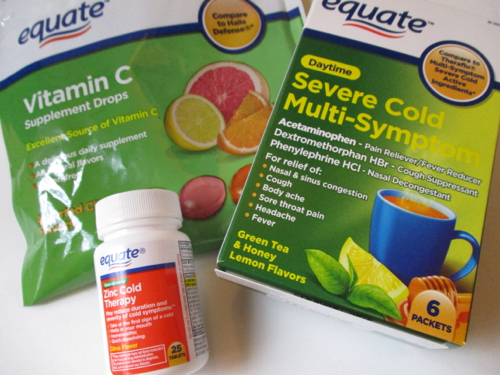 ), zinc tablets, and vitamin C lozenges. 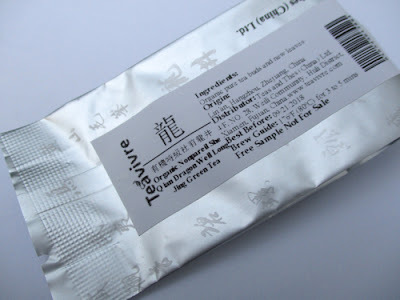 This week I sampled a new Dragon Well I received from Teavivre, their Organic Nonpareil She Qian Dragon Well Long Jing Green Tea. As always, I enjoyed the Dragon Well's appearance, scent, and flavor, and it was so good that I wasn't surprised to go online and learn that this is a "very supreme" grade of Dragon Well, with leaves from the spring's first flush! Whenever I have Dragon Well tea, I enjoy the distinctive look of the long, flat leaves. It's even fun to watch them steep, and I inhale the slightly vegetal scent while the tea is doing its thing. But the taste, of course, is what's best. This is one of those green teas that has a nice smooth mouth feel, and I look forward to sipping more cups of it this week as a change from the spicy fall teas I've been drinking. 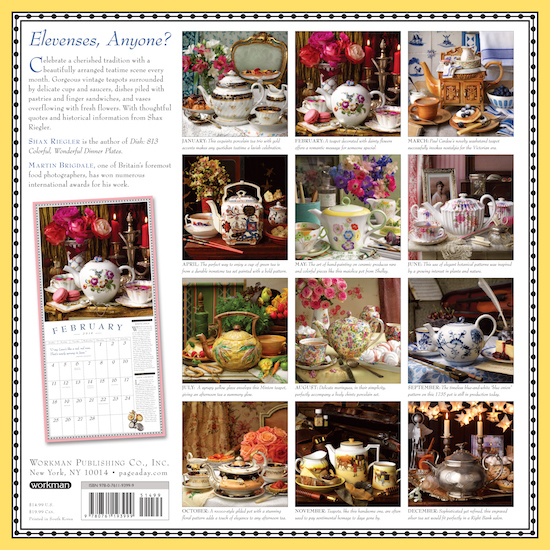 To learn more about the many great teas from Teavivre, click here. I have a confession to make. 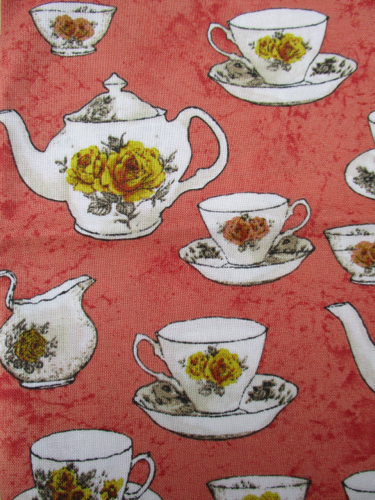 You know that sacred Susan Winget Tea Time fabric I acquired (after much searching and the kindness of two readers) over the summer? I haven't settled on a pattern to use it yet. I've found several patterns that were contenders, but when I pulled out the fabric and my rotary cutter, I just couldn't do it. One of my life mottoes is "When in doubt, don't," so I didn't. But that hasn't stopped me from continuing to collect other fabric and patterns—or from sewing something else in the meantime! So here's what I've been up to. 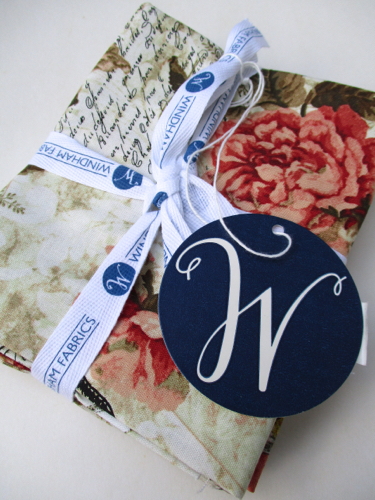 This pretty set of fat quarters by Whistler Studios for Windham Fabrics is so lovely, I had to order it from Missouri Star Quilt Company (and I have absolutely *loved* ordering from them because of their great customer service, witty communications, and speedy shipping). 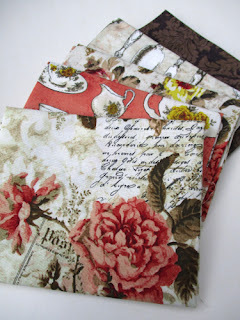 So why was I so smitten by this fabric? Perhaps it was the name. This piece of fabric is my favorite in the bundle, and it seemed appropriate to seek something with fall hues at this time of year. This one's great too, isn't it? 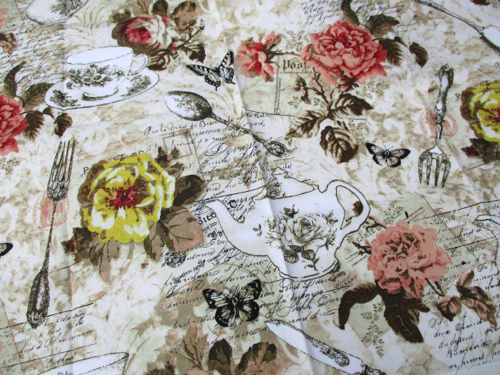 The fabric arrived only the other day and I haven't even planned what to use it for yet, but I am learning that if I see a tea-themed fabric, I'd better get it now, because by the time I *finally* decide on a pattern, the fabric will no longer be available. Despite my slow-as-molasses approach to selecting a design, I have been sewing, but I've been using fabric that is so absolutely unlike me, I can't even explain why I love it so. 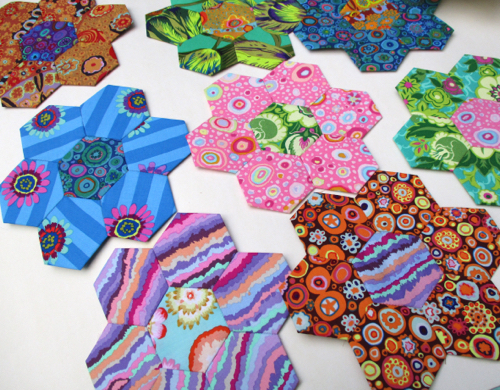 I've been making what they call "hexies," these English-paper-pieced discs in hexagon shapes, which are then sewn into flowers. (And okay, this Anglophile probably likes the fact that this is English paper piecing.) From what I've read, this pattern is also known as Grandmother's Flower Garden and was one of the most popular quilt patterns of the 1930s, which makes sense since Depression-era women could make it with fabric scraps. 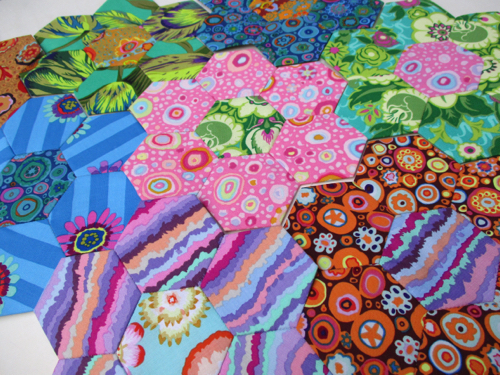 But wow, the colors in these Kaffe Fassett fabrics (found at a quilt shop in Rome) are wayyyy out of my comfort zone. They don't match a thing in my house. I can't imagine what I'll do with this throw/quilt/spread when I finally finish it, but I don't care. Making these is so fun, and when Alex and I have been binge-watching "24" with Kiefer Sutherland on the weekends (because we have pretty much forgotten the plots from watching the show the first time around), these are what I work on. I originally thought that when I have enough of these stitched, I'd like to just sew them all together edge to edge like this, with no rhyme or reason to the psychedelic coloring. 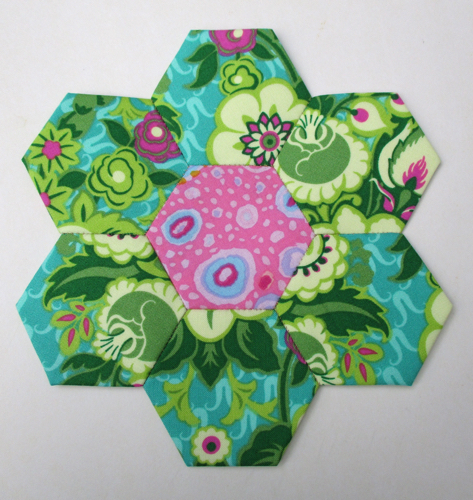 But then I saw a Pinterest photo of such a quilt with white hexies surrounding each flower. This gives you an idea of what that would look like, and I do believe it would highlight the colorful fabrics even more. 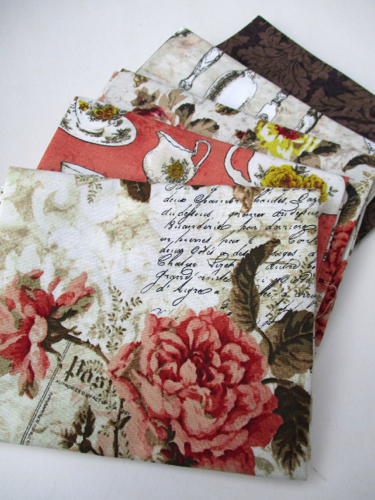 So, crafty friends, what all are you working on this fall? 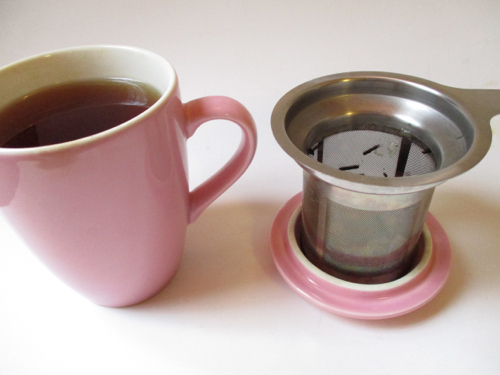 Last month I wrote about receiving some new samples of BOH teas, a brand that was new to me. I tried and enjoyed the flavors on the top row of teas to begin with, all of which I enjoyed, and this week, it was time to try the herbal teas on the bottom row. The taste and quality of herbal teas can vary widely, but I enjoyed each one of these varieties! The Lemon Myrtle had a bright citrusy taste that wasn't quite like any other lemon-flavored tea I've tried lately. The Peppermint had a nice bold peppermint flavor (I sometimes drink it in the afternoon because I've heard the scent of peppermint makes you more alert), and the Camomile was the classic camomile taste so familiar to those of us who enjoy this herb. 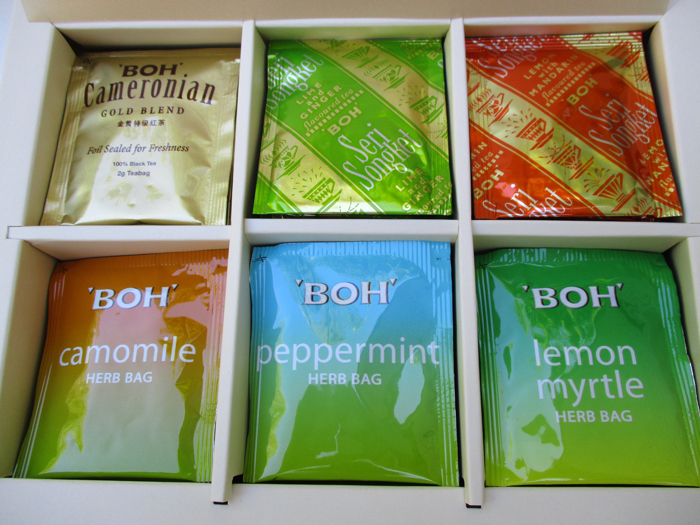 I greatly enjoyed sampling all of these BOH teas. You can find out more about these teas here, and if you happen to be doing some early Christmas shopping, now through December 31, 2017, you can use the code TFRIENDS to get 10 percent off your order of these and other BOH products on Amazon.com. 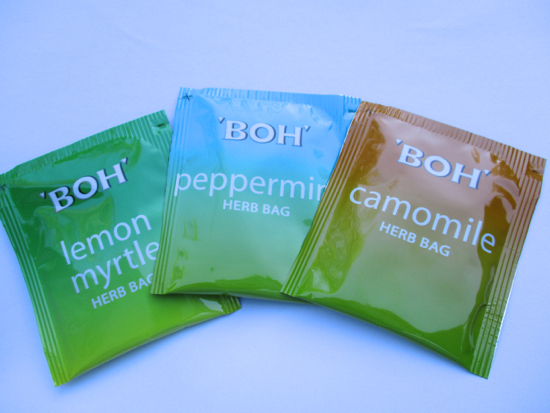 Thank you again to BOH Tea for the samples and for the great discount for my tea friends! I know, I know. I don't like to rush the holidays either, but here's the thing: if you don't shop for Christmas decorations now, the good stuff will be gone by the time December rolls around! 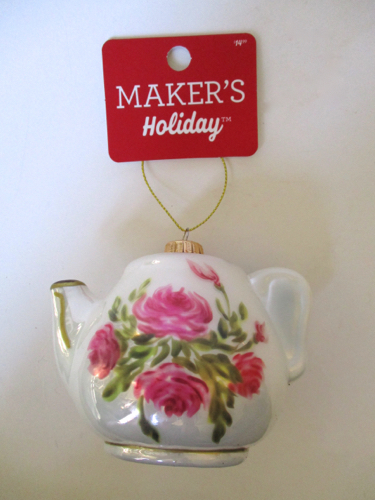 And so I bought a lovely new ornament at Joann last week. It was $14.99, which is high by Joann standards, but with my 40-percent-off coupon (thank you, iPhone app), it was only $8.99. 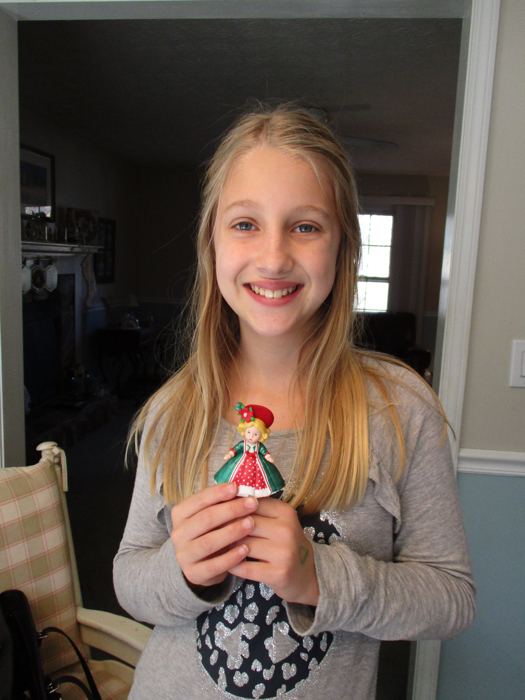 And this ornament is rather large, about 3 inches by 4-1/2 inches, so there's that.